2. Editorial cartoonists often use symbols to represent an idea. What do the Donkeys symbolize? 3. Write a statement that summarizes the news item to which this cartoon refers. 4. Do you agree with the cartoonist’s portrayal of Congressional Democrats? Explain your answer. 2. A donkey is the symbol of the Democratic party. (An elephant is the symbol of the Republican party.) 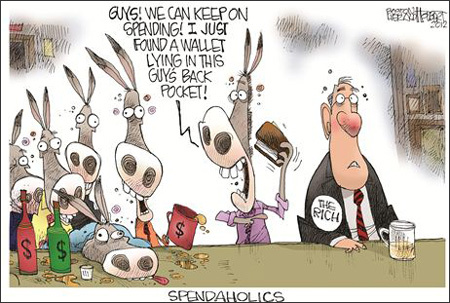 The Donkeys in the cartoon symbolize the Democrats in Congress. 3. The country is headed off the fiscal cliff, and Democrats and Republicans can’t agree on how to stop it: President Obama and Congressional Democrats want to increase taxes on the rich (those making over $250,000/year) to reduce the deficit; Congressional Republicans want to extend the Bush tax cuts.